Fourteen years may have passed between albums for THE WORD, but that’s no suggestion of broken bonds. Nor of broken strings. A love of music, of extended improvisational collaboration, of closing the eyes and channeling the feel—these are the ties that bind THE WORD. The genesis of THE WORD began in the year 1998, when the Avant-jazz and funk group Medeski, Martin & Wood took the burgeoning North Mississippi Allstars on their first tour. Riding down the road, the groups listened to the first two Arhoolie Records compilations of sacred steel guitar, a musical style then just seeping into the broader public awareness. Sacred steel is ecstatic pedal steel guitar used in sanctified churches; it’s the same instrument familiar to country & western music, but played with the authority and scale of a church organ. Keyboardist John Medeski and Luther Dickinson cooked up the idea of recording an instrumental gospel album with the Allstars (Luther Dickinson—guitars; Cody Dickinson—drums; Chris Chew—bass) in Medeski’s Brooklyn studio. When they learned that a young sacred steel star named Robert Randolph lived in New Jersey, they invited him to their area gig. This was THE WORD’S big bang. Soul Food reflects the band’s geography, beginning in a New York studio and finishing in Memphis at the home of Hi Records (a studio untouched since 1969, where Al Green recorded all his hits, where Mark Ronson recorded “Uptown Funk”). In New York, they each brought material to the table—Cody brought “New Word Order,” inspired by listening to Dr. Martin Luther King’s “Free at Last” speech; he took the chord changes Dr. King evoked and the rhythm of his delivery and developed the song. John brought “Swamp Road,” inspired by New Orleans pianist James Booker and previously rendered on an obscure session John did with DJ Logic. Robert brought “Chocolate Cowboy,” which Cody drives with the sanctified church beat that gets the congregation popping out of their seats and doing the sacred equivalent of the punk rock pogo. Robert’s mellow and seductive instrumental “The Highest” already has R&B singers clamoring to put words to it. “When I See the Blood” is a traditional hymn (though it’s never been done like this). Luther and John had both worked with vocalist Ruthie Foster; she’s from a family of Texas gospel singers but is versed in blues and folk. They knew she’d be great with the lead. “Glory Glory” is a new sound unto itself, featuring the debut of the world’s first acoustic pedal steel guitar, a dobro that’s been outfitted with four pedals. The inventor drove it from Nashville so Robert could try it. The band sat in a circle with acoustic instruments and this traditional song—one they’d all played many times and many different ways—flowed like water from the rock. For vocals, they turned to Amy Helm, daughter of the late Levon Helm, a nod to the past and the future. The title song was among the last material they recorded. Willie Mitchell’s daughters prepared a soul food spread for the band and they ate to their spirit’s content. “Robert ate three plates of black-eyed peas,” says Luther, “and then he said, ‘We have to go play!’ It was all we could do to keep up with Robert by the end of Memphis.” Their bellies full, they struck a new mood, a jam in two distinct parts, a contemplative and ethereal meditation, first evoking Hawaiian waves, Stax soul and crime movie soundtracks; sailing with the seraphim, they move into the second part like the return from a New Orleans funeral, bouncing on a second line, keeping one foot in the church, letting the other dance in Detroit, ride in the saddle, meander where it will. “Blurring the lines between New Orleans, Memphis and New York—that’s the American dream!” says Luther. They named the jams after the meal they’d just eaten, and the sustenance proved a good name for the album too: Soul Food. Bassist Chris Chew, who was raised playing in the church, has a mantra: Keep the faith. These musicians all climb to a musical cliff and they all leap, not knowing how they’ll fall or where they’ll land. But they have faith in each other’s playing, and they let the music and the muse be their guide. THE WORD: It’s secular. It’s sacred. It’s certainly spiritual. 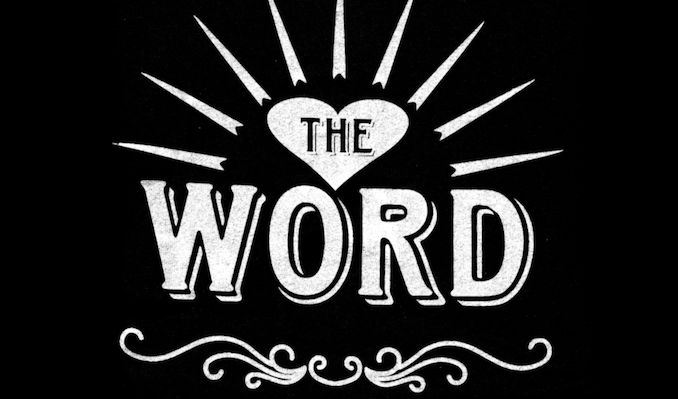 It’s THE WORD and now it’s time, once again, to take THE WORD to the world.